This morning, Dr. Deb Wiley and Kisha Gallagher spoke with special guest, Dr. Hollisa Alewine of The Creation Gospel about the heart of the Torah and Shavuot (Pentecost). Where does the idea of “fire” on Shavuot originate? How are fire and water related? What message are we to learn from the traditional seven ushpizin (guests) that visit with YHWH’s people as they sit in their sukkot, and how does this connect with Shavuot? All these questions are answered and much more on Hebrew Nation’s Renewed. The Creator, in these latter days, is restoring the role of women to HIS original design. Women are desperately seeking the freedom to live out their God-given purpose within the perfect and holy boundaries of the Torah (Bible). I’ve received many emails in regard to my original seven posts. Some were cries of elation and jubilation at the prospect of real freedom and balance. Others were notes of skepticism or a fear of women taking over the assemblies. And a few were a mixture of both, but with a heart set on openness — a sort of “let’s wait and see”. In light of this, I am compelled to continue with this series. While I certainly don’t have all the answers (in fact, I have more questions than anything else) I do have a heart to share my journey with you. While men may be the primary builders of physical houses, women build the house of their husbands and the House of the LORD. Obviously, men play a very important role in this process as well, but our focus is to explore how it is that “women build”. Do you recall how YHWH created the woman? In Part I, we looked at how YHWH formed/molded Adam. (He literally came from the dust of the earth.) In the beginning, both man and woman were within the one Adam. In the eyes of the Creator, this wasn’t good or tov. So, you know the story, He took a rib from Adam and built (banah) Chavah (Eve). As a quick aside, notice that she came from his SIDE, not his feet where she would be “beneath” him. Nor did she come from his head, implying that she would be “above” him. She came forth from Adam’s side (tsala) as a perfect and coequal partner. YHWH built Chavah. This Hebrew word for build, banah, is the same word used in both of the verses I quoted above in Proverbs and Ruth. The one who was built is the one who builds. She does this in several ways that I will enumerate shortly. But in order to grasp why this is true, we must first remember God’s design and function for women. In Part V, we discussed that women are a living parable of the Holy Spirit. Likewise, men will reflect the characteristics of our Heavenly Father and Yeshua. But as I’ve mentioned multiple times, God is One. Thus, we are NOT trying divide God into male and female. However, the ONE God did sovereignly choose to reveal Himself to us in ways that our little peon brains can understand. What do we see in Creation? We see nearly every creature on earth coming together as male and female to produce life. The natural things are meant to teach us spiritual truths. (I Cor. 15:46) Therefore, it should not be surprising that in Hebrew, the Holy Spirit and all of its manifestations are in the feminine. Just as all the references to God being our Father and Husband are masculine. The One true God is neither male or female, He is a Spirit. But in order for us finite humans to reflect His magnificence, it takes both a male and female. I only belabor this point because there are some that think it is evil or some type of goddess worship to refer to God in the feminine. I can only shake my head and pray. People fear what they do not understand and they like to throw stones at those that challenge the high places of their minds (tradition). Many false gods are male; does this make referring to God in the masculine something akin to Baal worship? Of course not, but the converse is also true. The second Spirit is binah or understanding. This spirit takes the raw materials of wisdom and begins to separate and distinguish like kind. In other words, binah begins to banah (build). As you’ve probably guessed, the Hebrew root of banah has the same consonants as the word binah. You can think of binah as organizing and counting the costs for a home construction. It is in this spirit that a woman builds. -- the spirit that separates and discerns. Upon What Does She Build? The spirit of binah compels a righteous woman to discern between good and evil (read Proverbs 4). 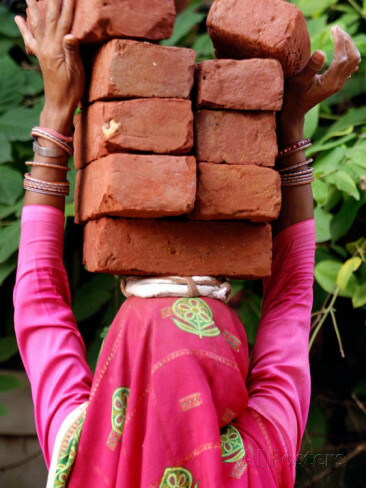 But without a strong foundation, she cannot expand the House. This is where her counterbalance (the male) becomes a necessity. Men and women were meant to work and labor together in marriage and in the assembly. Each is a part of the whole. The man, being the image of the Father and the Son, is the woman’s rock or foundation stone. To carry this analogy a step further, consider the millions of seeds (words) a man gives a woman to choose from. Out of what seems to be an infinite number of possibilities, she (usually) only picks one seed (idea/word) at a time. She then devotes her full attention to see it nourished, protected, and brought to maturity. Are you beginning to see how the spirit of binah operates? A woman takes the unlimited possibilities and potential of a man and surrounds it like the Holy Spirit. She is the container for his strength, his seed. 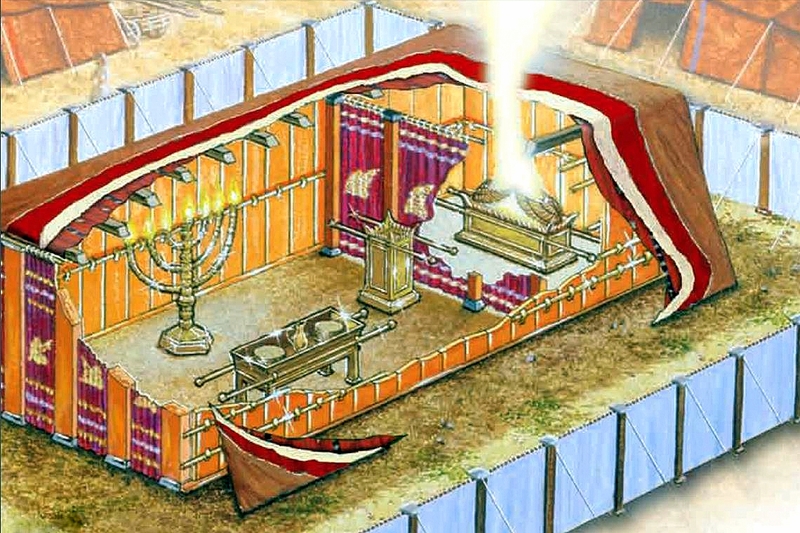 Together they build their house and the House of Adonai. Dr. Diana Dye also has some great teachings on how a “woman builds”. You can find them here and here. She uses the imagery of the Tabernacle and Temple to further the analogy we’ve been building upon (pun intended). It’s quite a fascinating prospect. The very first letter of the Bible is an enlarged bet, the pictograph for a tent or house. From the very first letter of the Bible, the Creator has made known His intent and purpose in creating us and giving us His Word. His top desire is to enlarge, expand, and BUILD His House. In my Father’s house are MANY mansions. The Holy Spirit went through great pains to carefully delineate how the Father’s House is to be constructed. Studying the Tabernacle and the Temple gives us a foretaste in not only how we approach our King, but in how we build (or rebuild) our bodies, families, and assemblies. It’s really powerful. For our purposes here, consider the fact that the House must be carefully maintained, repaired, cleaned, and at times, even rebuilt from the foundation up. This teaches us that our homes and our temples (bodies) will require this same diligent care. This might manifest in various areas and stages of child rearing, marriage building/counsel, financial/support/growth, or even physical/spiritual cleansing. Think of all the areas that are the “house”. Working from the inside out, this is your physical body, your family, your assembly, and the greater body of God’s people. Sometimes a demolition is what is necessary in order to rebuild upon the Rock. Do you need a fresh start? A clean slate? Remove everything that offends and rebuild; it’s never too late. Rebuild your marriage. Rebuild your relationship with that family member, coworker, or assembly leader. Restore the House. of the man (especially the Son of Man). Key 3: Sometimes the house must be rebuilt. As a living example of the Holy Spirit, a woman will (usually) be what sets the tone for the atmosphere of the home, assembly, and workplace. Far more than men, women determine whether the house is filled with shalom or has a lack thereof. “If mama ain’t happy, ain’t nobody happy” is a saying that speaks a truth that has not escaped the masses. As a picture of the Holy Spirit, women are called to be long-suffering with their husbands, children, and the greater assembly. They are meant to be the ones that can bring correction and instruction with tenderness, sensitivity, and gentleness. This is the very reason that YHWH entrusts women with the most fragile of all lives: infants. Women are designed to lead, guide, and teach the immature with patience, love, and mercy. This physical picture is also true in the spiritual realm (think spiritual babies). The lost, seekers, new believers, and those that haven’t grown past the formative years of the faith usually respond with growth (building) when the message is delivered with the tender mercies of the feminine aspect of God. Obviously, both men and women can operate with this quality through the empowerment of the Holy Spirit. However, the natural representation of this is revealed in the female. In a similar way, a woman will fill her house, but she will be tested in the matter of what “spirit” she does the filling with. Will it be the Ruach HaKodesh or will it be another spirit? A woman must choose (yes, it is and always will be a choice) to walk as a victor over her nephesh (flesh), emotions, hormones, and circumstances. When you choose to be the “victim” instead of the “victor”, you are in effect stepping on the blood of Messiah. He has either provided the Way or He hasn’t. His grace is sufficient or it isn’t. I know it doesn’t always “feel” this simple. But the truth is that we always have a choice even in areas where we feel completely out of control. Every time a woman is able to exercise self-control over her lower nature (flesh/nephesh), she reflects the image of God as she was designed. She becomes a holy witness to her husband, children, family, friends, and assembly. Like the Holy Spirit, her presence “woos” people to the Father. Under her tender care, the immature feel safe to explore, learn, and prosper. This stage is necessary for every believer in the God of Israel to grow unto maturity. If they are built up as strong panels in the house by the Spirit, they understand (binah) why the flesh must be put on the altar (death). The Father’s instructions require maturity in the Spirit, because the letter kills (the flesh). This is liberty! And it produces humble and gracious vessels that desire to set other captives free. Key 4: The Holy Spirit fills the House of Adonai. The woman fills her house with a “spirit” as well. which brings the liberty needed to grow and mature. Turning toward the feminine voice of God (as manifested through His daughters) enables one to be filled with the Spirit. And, it makes the Father’s words to be made known unto us. In other words, there is intimacy, not just rules. The sixth Spirit of God is knowledge (Da’at). (Is. 11:2) It is a mature spirit of sacrificial love. No longer is the focus on what the Lamb has done for me, but what I am willing to do for the Lamb. In order to reach this place of maturity, a person must first learn to move through and with the first Spirit of Adonai, Wisdom (chokhmah). Da’at is so intimate that it causes reproduction (both physical and spiritual). Knowing this should give us a deeper understanding (binah) of Yeshua’s words in Matthew. Can you see both the masculine and the feminine clues in these verses? Look at these keys words. These verses strongly hint at how the House of the LORD is built with strength. How will it remain when the storms come? The House must be operating with both the masculine and the feminine working together — for only together is the true image of Elohim displayed in the natural. This is a House of Strength. The above example in Matthew is just one testimony of the truth that was birthed in the beginning. the immature to hear (know) the Words of Adonai. Have you ever noticed that most of the denominations that are leery of (or against) the Spirit’s activity of prophesy, casting out demons, and the general working of miracles are also usually against women operating in any “seen/outward” role in the home or assembly? Do you believe that this is a coincidence? The Holy Spirit is THE feminine expression of God. If natural women are silenced, is it surprising that the supernatural Spirit is also quenched? The Spirit (feminine) is what brings the intimacy of “I know you”. She is shouting from every corner; will we heed her voice? But the converse is also true. Those that forsake the masculine, forget that the foundation IS the Word, the Rock. The Spirit doesn’t supersede the written Word. Ignoring what has been solidly penned beforehand for our instruction (Torah) is just as detrimental to our “building”. Without the hard and firm masculine foundation, we build on sand as mere hearers only. This is what it means to be a practicer of “lawlessness”. How many assemblies do you know of that embrace the works of the Holy Spirit on the one hand, but speak evil of the law (Torah) on the other? Without the balance of the Father’s instructions, we may become intimate with an unholy spirit. This spirit may imitate what is holy unto YHWH, but in reality only comes to steal, kill, and destroy. Only by building upon the foundation of “it is written”, will we be able to discern (binah) the difference between the harlot and the righteous woman. In Part IX, we will take this building aspect of women one step further by looking at those that FIRST received the Torah and the Gospel. 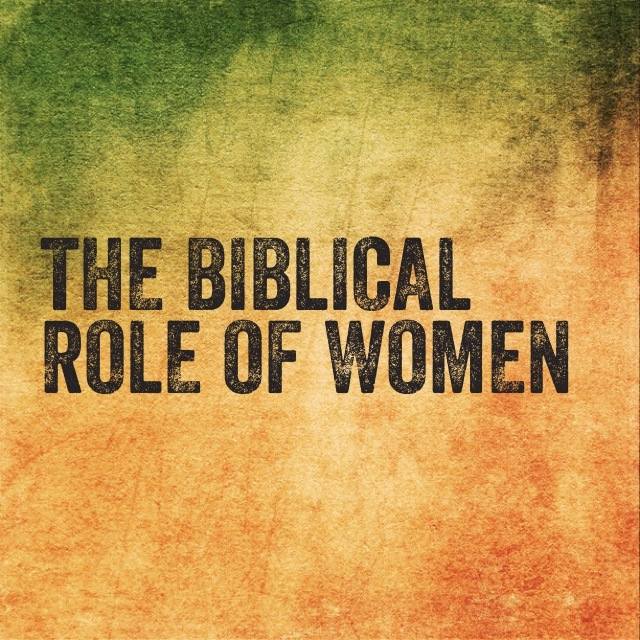 Key 1: A woman begins to build with the spirit of binah — the spirit that separates and discerns. Key 2: A woman builds upon the firm foundation of the man (especially the Son of Man). Key 4: The Holy Spirit fills the House of Adonai. The woman fills her house with a “spirit” as well. A wise woman will build with the Holy Spirit which brings the liberty needed to grow and mature. 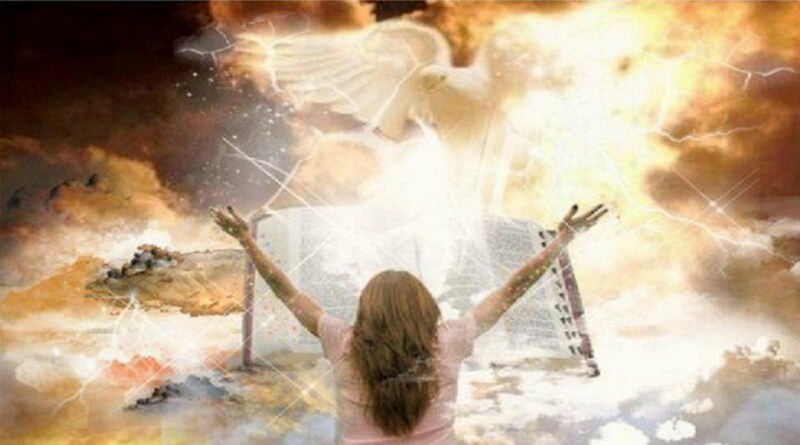 Key 5: A woman filled with the Holy Spirit enables the immature to hear (know) the Words of Adonai. Like the Holy Spirit, she brings intimacy to the relationship. For previous articles click here; the next article in this series is Part IX. Mt. 7 and Lk. 6. Interestingly, the context of Yeshua’s parable is about being both a hearer and a DOER of His Word. This same message is repeated in the Proverbs 4 chapter that I suggested for you to read. But like a concerned mother, the Holy Spirit can also manifest with great power and fierceness. We will look at this aspect of the Spirit in a later post. See Isaiah 11:2 and The Creation Gospel workbook one by Dr. Hollisa Alewine. Why does Torah portion Bereshit seem to interrupt the natural flow of the creation narrative to interject the telling of the rivers of Eden? Does this break in the story seem strange to you? In her commentary on Bereshit in The Creation Gospel Workbook 5 Volume 1, Dr. Hollisa Alewine expounds on the odd placement (or is it?) of the details of the one river that divides into four in Genesis chapter two. Dr. Alewine’s commentary on Bereshit delves deeply into the rivers of Eden (about 50 pages worth!). Obviously, this is a much more comprehensive treatment than I will offer here. If you have the time, I urge you to study the Creation Gospel model and her commentary on Bereshit. I hope to give you a summary of these fascinating rivers and a taste of Dr. Alewine’s work along with thoughts of my own. Gen 2:10-14 Now a river flowed out of Eden to water the garden; and from there it divided and became four rivers. (11) The name of the first is Pishon; it flows around the whole land of Havilah, where there is gold. (12) The gold of that land is good; the bdellium and the onyx stone are there. (13) The name of the second river is Gihon; it flows around the whole land of Cush. (14) The name of the third river is Tigris; it flows east of Assyria. And the fourth river is the Euphrates. First, what is a river in Hebrew? In our passage above, the Hebrew word translated as river is nahar. According to Brown, Driver, and Briggs’ Hebrew Definitions, nahar is a stream, river, or underground stream. It comes from the root verb nahar meaning to shine, beam, light, burn, be radiant, to flow, and stream. Please keep this imagery of a river as flowing water and flowing light at the forefront of your mind as we continue. From the Garden of Eden (paradise) the “head” or beginning of the ONE river divided into four other rivers. Before we get into the details of these four rivers, let’s first explore what we know about the number four. As I’ve explained in other places on this blog, four can be a representation of seven or completeness. Day four of creation establishes for us the “governing” aspect of this number. There are many places in the creation (nature) and the Holy Scriptures that speak to the imagery of four depicting completeness just as seven does. The seven branched menorah displays this imagery (in the natural) better than any other motif. Consider that the source or center branch is the fourth branch no matter which direction you begin your count. Messiah Yeshua stands at the center of this lampstand as He is the source from which all things flow. This brings us back to the beginning or Bereshit. John 1:1-5 In the beginning was the Word, and the Word was with God, and the Word was God. (2) He was in the beginning with God. (3) All things came into being through Him, and apart from Him nothing came into being that has come into being. (4) In Him was life, and the life was the Light of men. (5) The Light shines in the darkness, and the darkness did not comprehend it. It is through the divine Light of Messiah (He as our menorah) that all things came into being and are held together. As the source of LIGHT, He rescues us from the darkness and brings us to redemption. He is the beginning of “in the beginning”. Col. 1:13-18 For He rescued us from the domain of darkness, and transferred us to the kingdom of His beloved Son, (14) in whom we have redemption, the forgiveness of sins. (15) He is the image of the invisible God, the firstborn of all creation. (16) For by Him all things were created, both in the heavens and on earth, visible and invisible, whether thrones or dominions or rulers or authorities–all things have been created through Him and for Him. (17) He is before all things, and in Him all things hold together. (18) He is also head of the body, the church; and He is the beginning, the firstborn from the dead, so that He Himself will come to have first place in everything. As LIGHT, He is both the source branch on the menorah (4th) and the fullness thereof in its seven pipes. Rev 1:12-15 Then I turned to see the voice that was speaking with me. And having turned I saw seven golden lampstands; (13) and in the middle of the lampstands I saw one like a son of man, clothed in a robe reaching to the feet, and girded across His chest with a golden sash. (14) His head and His hair were white like white wool, like snow; and His eyes were like a flame of fire. (15) His feet were like burnished bronze, when it has been made to glow in a furnace, and His voice was like the sound of many waters. The primordial Light of day one in Genesis 1:3 was not the natural light of the sun, moon, and stars (created later on day 4), but was the glorious spiritual Light of Messiah. He is the Light in the darkness and the Life of men. While “light” is certainly a symbol for God given to us in Genesis 1:3, there is another symbol that precedes this primordial “light”. In Genesis 1:2, we see the Spirit of God hovering or moving upon the face of the waters. Thus, we learn two things. The Spirit of God is active with movement and that movement is characterized by WATER. Does Messiah have any associations with water? The Beloved disciple John, the one who points us to the beginning and the primordial light, also points us to the ancient waters as the source for eternal life. The Messiah Yeshua, as the image of the invisible God, is also the source for the living waters of eternal life. Jeremiah declares that these living waters are from the beginning and find their source in the glorious throne of YHWH. Thus, we see the Living waters in the beginning — before all things. Time doesn’t run on some infinite straight line, it is a circle or a cycle according to what we see in the creation, Hebraic thought, and the Bible. What is happening in the beginning will also happen at the end, completing the divine pattern or cycle. What do we see at the end? Rev. 21:6 Then He said to me, “It is done. I am the Alpha and the Omega, the beginning and the end. I will give to the one who thirsts from the spring of the water of life without cost. Though the river in Genesis chapter two isn’t named, I bet you can guess what it is called. It is the Source, the Head, and the Beginning. It is none other than the River of Life. The Holy Spirit inspired Scriptures captures this imagery in a perfect circle from beginning to end. The River of Life (like Messiah) was, is, and is to come. It has always been there flowing from the Throne of YHWH. Does the Genesis narrative about the rivers have a little bit more significance in your mind now? Perhaps learning about them can bring us some greater insight into not only the beginning, but the end. 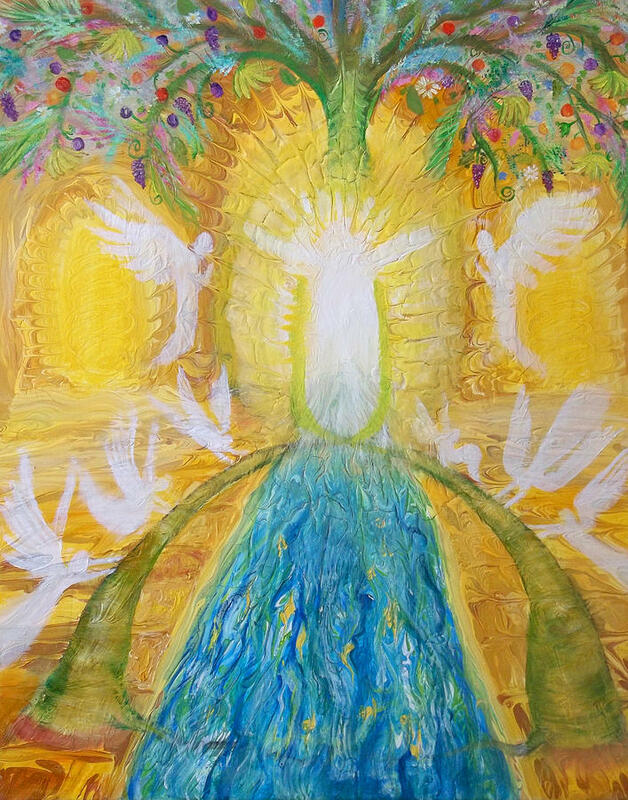 The River that pours forth from Eden (paradise) and the Throne of YHWH divides into four other heads. Now, let’s go back to our menorah motif again. 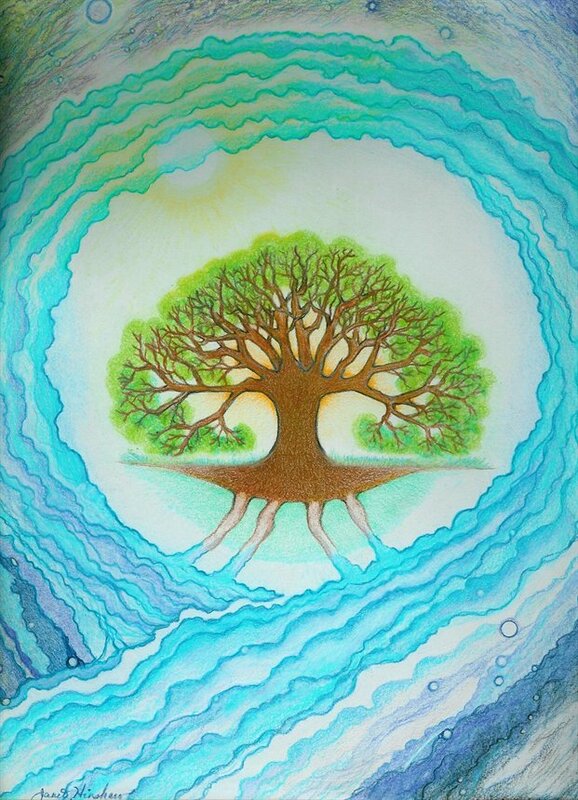 Imagine the River of Life as the source or center branch, fueling or feeding the outer six branches, giving them Life. In the natural, this river would be the Euphrates. Now, I’m not suggesting the Euphrates IS the River of Life; instead, I’m speaking metaphorically. Notice how one and seven mirror one another as do two and six and three and five. Moreover, you can trace with your finger how they are indeed connected at the base; yet the source for them all is the Messiah or the River of Life. By the way, this “mirroring” or chiastic structure is also true for the seven days of creation, the seven Spirits of God, the seven feast days, and the many sevens found in the Book of Revelation. You can learn all about these fascinating truths by studying the Creation Gospel by Dr. Hollisa Alewine. Perhaps it is a little clearer now as to why Moses gives us more information about the river Pishon than he does for the other three rivers. Looking at the graphic again, you can see how the Pishon encompasses the entire menorah as the outer shell or completeness of the entire menorah. Before we move onto the meaning of the names of each river and their significance, I want you to look at the graphic one more time. Now, imagine if there were a second menorah upside down on the top of this one. What would you see then? It would be a complete circle with smaller circles on the inside! Perhaps a wheel in the middle of a wheel? But I digress… that is indeed a whole other study in itself — though it is directly related to this one. (: Nevertheless, it is important for you see the complete picture of this circle or cycle as two of the rivers we will study imply surrounding, encompassing, and circling. Do you recall from the beginning of this post how that in Hebrew a river is not only water, but a mechanism for carrying light? Do you also remember the crystal clear waters flowing from the throne of God? (Dan. 7:10) Could these same “fiery” waters be life to the righteous and yet a “lake of fire” to the wicked? This is something to consider since the end has been declared from the beginning. Moreover, the equivalence of fire and water is pictured all over the Bible as both symbols for God and conversely of judgment. For our study, consider that these waters from Eden are both flowing fire and water. Whether they burn or cleanse is determined by whether you are wicked or righteous. These flowing waters from Eden are like the Holy Spirit blowing and flowing around and among His people. Like with Daniel and his companions, the fiery furnace of the Holy Spirit is a cool cleansing heat from heaven that protects the righteous, but burns the wicked. Instead of starting with the first river listed, let’s start with the last or what sits at the center of the menorah. This is the River Euphrates or in Hebrew Perat. The word perat comes from the word pri, or fruit. (You might recall the latter from the Kiddush blessing.) The source branch (river) on our menorah is meant to represent the Holy Spirit of Messiah. 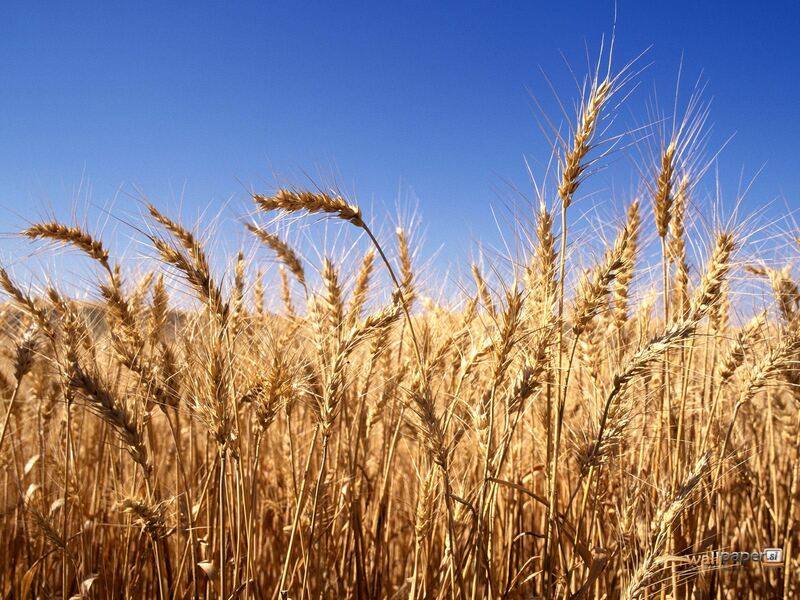 It is akin to the moed (feast) of Shavuot (Pentecost), the feast of first FRUITS. The Bible doesn’t describe for us how the Perat flows as it does with the other three rivers. This hidden action also points to the Holy Spirit. We cannot see Him, but we can feel His presence like the wind. Perat also has the connotation of “breaking forth”. Power and permanence are two words that would describe this river and the Holy Spirit. For now, think of Perat as the source, head, fruitfulness, and increase. We will build upon this with the other rivers. 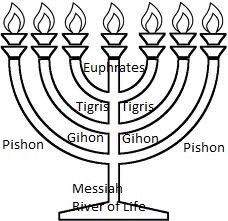 Moving to the third and fifth branches on the menorah, we come to the third river mentioned, the Tigris or in Hebrew, the Cheddekel. This river is said to be “going” or quite literally in Hebrew, “walking”. Creation Gospel students will draw the connection to the “running feet” of the birds and fish created on day five. Cheddekel means rapid, roaring, or noisy. This river isn’t a quiet stream as it is characterized by noise and movement! This should also remind you of the shouting and blowing of trumpets during the fifth feast of Rosh HaShanah. Arousing sleepers from the grave first with Yeshua on early firstfruits and later with the resurrection of His full harvest at the feast of Trumpets does indeed require movement and great noise like the River Cheddekel! Think of noisy movement, awakening from sleep, and (the Spirit of) power when you think of the Tigris. Again working toward the beginning, we next come to the River Gihon. It resides on the second and sixth branches on the menorah. Gihon means to burst forth, give birth, or to gush. This river is said to encompass (savav) the whole land of Ethiopia (Cush). Do you see the circling or surrounding aspect of this river? Cush means dark or black. It can easily symbolize the darkness of burial as pictured in the Messiah’s burial during the days of Unleavened Bread. Moses, the one “drawn forth” from the water, married a Cushite woman. This is likened to the Torah being drawn from the eternal waters of Eden and the Bride being, “black, but comely”. We are truly black or dark (in darkness) until our bridegroom redeems us with His Light and Fire. Only then can we be portrayed as white, like the linen worn on the High Holy Days. The surrounding flow of the Gihon washes us as do the second and sixth feasts of Matzah and Yom Kippur. Remember to associate the surrounding flow of the Gihon and its ability to transform us from darkness to light like its gushing/birthing name implies. The Pishon sits on the outer edges of our menorah motif, correlating to branch one and seven. We are given more information about this river than all of the others combined. Seeing that it encompasses or surrounds the entire menorah, this isn’t surprising. Within the Hebrew word Pishon, we have the idea of dispersing, spreading, scattering, or as Brown, Driver, and Briggs’ Hebrew Definitions notes for H6376, increases. Notice that this river flows around (encompasses) the whole land of Havilah, where there is good gold, bdellium, and onyx. Havilah and its root, chul, are defined as to circle, twist, writhe, travail, dance, or whirl. Within this word is the idea of birth pangs and tribulation. But like the Israelites travail in Egypt, the more they were afflicted, the more they increased and spread out. This led to the birth of the nation of Israel in the exodus to the wilderness. These themes are associated with the first and last feasts of Pesach and Sukkot. Moreover, to make this connection even more apparent, the rabbinical teachings say that Pishon is synonymous with the Nile River in Egypt. But what is the point in telling us about the good gold, bdellium, and onyx? I probably don’t have to reiterate what many have done before me in explaining the Biblical significance of gold. What Dr. Alewine astutely points out is that the text specifies that the gold is GOOD in Havilah. Why does this matter? Because for all the “good” symbolism we can see portrayed in refined gold, it does have a contranym (a word meaning its own opposite). Gold may very well represent heaven, spiritual wealth, and the removal of impurities, but conversely it can represent idolatry as seen in the golden calf. The gold in Havilah was GOOD. In other words, like the pilgrimage festivals of Pesach, Shavuot, and Sukkot, the impurities of leaven and sin have been removed. There is no malice; the streams are pure and gather together the pilgrims to the Holy City of Gold: Jerusalem. (Ever heard the song Jerusalem of Gold?) And let’s not forget that the golden menorah we have been using as a model for all of our fours and sevens is also made from pure gold. Bdellium is a fragrant gum much like myrrh. It comes from a thorn tree which produces a small particle of resin that appears to “tear” or liquefy when the sun (light) shines upon it. Wow! Does this description remind you of anything or anyone? Wasn’t Yeshua a sweet smelling aroma to the nostrils of His Father as He died on the tree? Did Yeshua not weep for us before His appointed time? This special resin in Hebrew literally means to divide, separate, distinguish, or even be set apart. Day one and two of creation and the first two feasts of Pesach and Unleavened Bread mirror this separation process. Like the good gold, impurities are what need to be removed or separated. But this process isn’t GOOD unless it leads to gathering together of like kind and like mind as fulfilled in the Jerusalem of Gold. While this is a glorious prospect, it may also be painful as it requires the weeping tears of repentance to enter. Rashi likened bedolach with crystal and its ability to take pure white light and separate it into the seven colors of the rainbow or visible light. Can you see this same picture on the menorah? One source (Light) streaming into seven beautiful colors that surround the entire menorah like the light refracted from a prism. Aren’t we told that there truly is such a rainbow encompassing the throne of God? (Rev. 4:3) Could this rainbow of Light be revealed in the seven festivals of gathering in Jerusalem? Is that not their purpose; to bring light unto His people and clear paths for them to walk in? Dr. Alewine also points out that the manna from heaven had a white look and appeared as dew upon the ground. Have you ever seen light refracted in the tiny water droplets of dew? Do you suppose it was any different when the children of Israel picked their manna up every morning? Could this have been a reminder to the children of Israel of the Throne of God and its rainbow canopy? In a sense, they were consuming both bread and light at the same time! After all, Yeshua is said to be both! Shoham comes from a word that means to “blanch” or “make white”. Hmm. An onyx stone is usually black or dark in color. Spiritually speaking, we call this “whitening” process sanctification or holiness. This idea is similar to the land of Cush we discussed earlier. Dr. Alewine compares this whitening to the “bleached” linen garments of the priests. These garments were made of shesh (shin, shin). Figuratively this connects the priests’ linen garments with man (six –shesh) and with fire (shin – aysh). Is the River of Life pictured in the four rivers of Eden, the seven days of creation, the seven Spirits of God, and the seven moedim (feast days) for Gentiles as well as Jews? Yes! Dr. Alewine points us to John 10:16. “I have other sheep, which are not of this fold; I must bring them also, and they will hear My voice; and they will become one flock with one shepherd. The rivers of Eden are one more testimony that from the beginning, YHWH has declared the end. The first letter of the Bible is an ENLARGED beht, meaning house or tent. From the onset of all things, the Father’s desire is to build and enlarge His House. Within the rivers and moedim (feast days) the good news of the gospel is proclaimed. This is the only place where the nations will find their healing and rest. The rivers of Eden surround and flow around the creation days, feasts, spirits of God, and our menorah motif. But they are meant to flow and move through you and me too! By keeping the appointed times set by the Creator on day four, we are equipped to produce the good gold of Havilah (increase). This refining process is a sweet smelling aroma (bedolach) to our Father as we are proclaiming His government (onyx) throughout the earth. Moving inward to the surrounding river of Gihon, the darkness (Cush/Ethiopia) is pierced as the sons of God prepare to burst forth in their unveiling. By the time the Tigris (Cheddekel) begins to flow through us, we are primed for new life and resurrection; because like the Tigris, we “walk” in the paths of the Creator. The gospel moves with rapid force throughout the earth. Finally, the Perat (Euphrates) produces abundance and fruitfulness as a great multitude from every tribe and tongue wave palm branches at the great Feast of Sukkot in worship of the King of kings! These are those that will rejoice with the four living creatures under the rainbow canopy of God’s Throne. Below the Throne, the River of Life flows freely to nourish and cleanse the righteous with the cool fire waters of heaven. The wicked will experience the same flow of this river, but it will be unto them a lake of fire and judgment. The end is the beginning and the beginning is the end! Selah. Examples: Baptism of water and fire, earth destroyed with water and later with fire, God was a pillar of cloud (water) and a pillar of fire to Israelites in the desert, the Hebrew word for heavens is shemayim, a word that literally means “fire-water”, etc. Brown, Driver, and Briggs’ Hebrew Definitions: H6376 פּישׁון pee-shone’ From H6335; dispersive; Pishon, a river of Eden: – Pison. H6335 פּוּשׁ poosh A primitive root; to spread; figuratively act proudly: – grow up, be grown fat, spread selves, be scattered. See Dr. Alewine’s Creation Gospel Workbook 5 Volume 1, pages 15 and 20. See Dr. Alewine’s Creation Gospel Workbook 5 Volume 1, p. 18. Dr. Alewine’s Creation Gospel Workbook 5 Volume 1, pages 34-35. Why Do We Read Jonah During Yom Kippur? Is this book about repentance (teshuvah)? Is it about second chances? Does the story focus on Nineveh or Jonah? Do you find Jonah’s attitude unwarranted? What is it about that plant or gourd that grows up and shades Jonah and then dies and withers from a worm? What does this all really mean for us at Yom Kippur? These questions are always on my mind (lev) as we read Jonah on Yom Kippur. But this year, I had some new information come to my attention that has finally answered some of the paradoxes I’ve felt when I’ve read Jonah’s story in the past. I mean, how could Jonah literally want to die because God pardoned Nineveh? What was happening that I don’t understand? What’s the REAL message I am to receive from this story? Is it just about second chances or is there more to it than that? When my boys were younger, we used to watch the Veggie Tales movie “Jonah” around Yom Kippur. The song “God of Second Chances” rings in my ears still to this day when I think of Jonah. I believe that Rabbi David Fohrman has finally put that ear worm to rest this year. In his segment of teachings on Jonah at AlephBeta Academy, Rabbi Fohrman digs deeply into the Hebrew of the narrative to bring forth quite a few rubies and diamonds. I really hope you will take the time to listen to all 6 segments as you afflict your soul this Yom Kippur. Rabbi Fohrman has a way of teaching and speaking that just affects me greatly. (Or as the Veggie Tale tomato would say, “It moved me Bob”.) 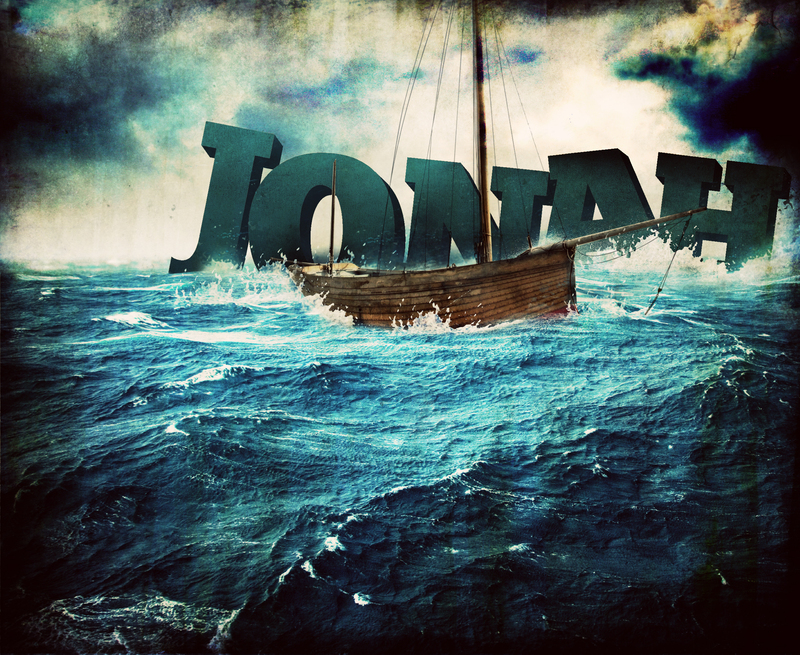 With this series on Jonah, Rabbi Fohrman has once again peeled back the layers of a familiar story to reveal a simple yet profound truth to me. In total, the segments are only about 40 minutes long— an easy feat for Yom Kippur. Why do we need both Justice and Compassion? Find out why in these segments. I have one more sweet treat for you on Yom Kippur. Dr. Hollisa Alewine has two great teachings that she has posted on the Creation Gospel Facebook page related to Yom Kippur. Obviously, you facebookers can go to her page and read these articles there. But for those of you that don’t do Facebook, I’ve provided the links to the posts below. These require some chewing, but they are a timely message about the True Spirit of the Moedim (Feasts). Enjoy!! May you have an easy fast (tzom kal)!